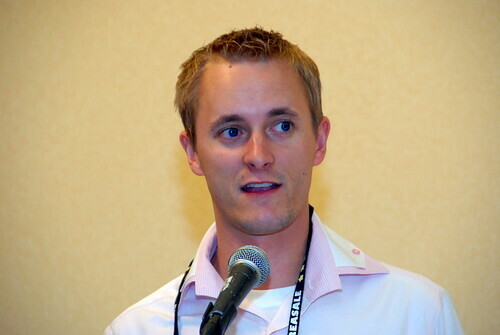 Matt Mckiewicz, founder of flippa.com, presented a great session at Affiliate Summit titled, Buying & Selling Established Websites for Profit. If you read my review of Wil Reynolds’ Keynote, you may remember he talked about the power of one: the one person or one session that made all of the time and money you put into getting to Affiliate Summit worth it. For me, this may be that session. I even toyed with the idea of not doing a write-up, as I found this information to be that valuable, but I’ll share it with you. Buying established, profitable websites gives you an instant stream of revenue, which you can then optimize, then resell for a further profit. Established websites already have traffic, and should have inbound links and original content (musts for SEO). Also, buying websites versus buying domains is not a guessing game. You can typically pick up a site for less than 2x annual revenue, so you know that you’ll make your money back in 2 years. But how do you value a domain? Buying domain names is like buying vacant land: it’s hard to build out. But buying established websites is like buying rental apartments: you start collecting the rent checks right away. Website owners also often miss opportunities to take their website to next level. You can buy a poorly designed & monetized site, fix some basic SEO and coding mistakes, and replace or optimize AdSense placements. The increase in traffic and earnings per visitor means overall higher revenue, which will shorten your ROI or increase the sales price if you decide to relist the property. You can also buy a website for the traffic alone. For example, if you had $2,000 to spend to buy traffic, you can buy 10,000 AdWords clicks at $0.20 each, or buy an established website with 10,000 uniques per month for $2,000, and get those 10,000 visitors month after month. Websites can also be used to add another backlink to your main website. Double bonus if the site is linking to your competitor, and you buy it and swap out the links 🙂 Websites listed on flippa are full of unique content, but many aren’t optimized for specific keywords. Go take a look at some of the WordPress blogs listed for sale, but aren’t using the Yoast plugin, for example. To find sites that may be available to purchase, go look at a DMOZ category, then go through the results there. If there’s an old copyright in the footer, contact the site owner (use contact form or whois record). The worst that can happen is they say no. Brokers, such as QuietLightBrokerage or WeSellYourSite.com, often deal with 6-figure listings. You’ll probably have to sign an NDA to see details on a listing. Then there are the online marketplaces. Some are dedicated to the buying & selling of websites (flippa.com, websitebroker.com), while some generic sites also list websites (ebay.com, BusinessesForSale.com). You can also find websites for sale on some forums (forums.digitalpoint.com, for example). There are a ton of tools you can use to evaluate the website you’re thinking about purchasing. Copyscape will tell you if the content on the site is unique or not. Open Site Explorer will tell you what sites are linking back to it. Of course, you’ll want to see the website’s Analytics (flippa will show you verified Google Analytics data), which will help you establish where the traffic is coming from. Talk to the seller via phone or Skype. Most people looking to scam others won’t talk to you on the phone. Matt went on with some case studies, which you can see in the presentation below. After Matt’s presentation, I’m psyched about the idea of scooping up some under-performing websites, doing some SEO and monetization optimization, increasing revenues then possibly reselling the properties. I’ve had great luck so far buying sites on Flippa. I’m curious did he give any suggestions how to make the “perfect ad” on Flippa to sell a site? No, Matt didn’t mention that. This was more about buying than selling sites. Website marketplace can be a doubtful place, especially if you don’t know how to do your due diligence. It’s okay to buy sites if you can really see that they can make you consistent income but conditions change month by month. If you are buying SEO optimized sites, rankings may go down sooner or later if you don’t build backlinks constantly after buying the website.